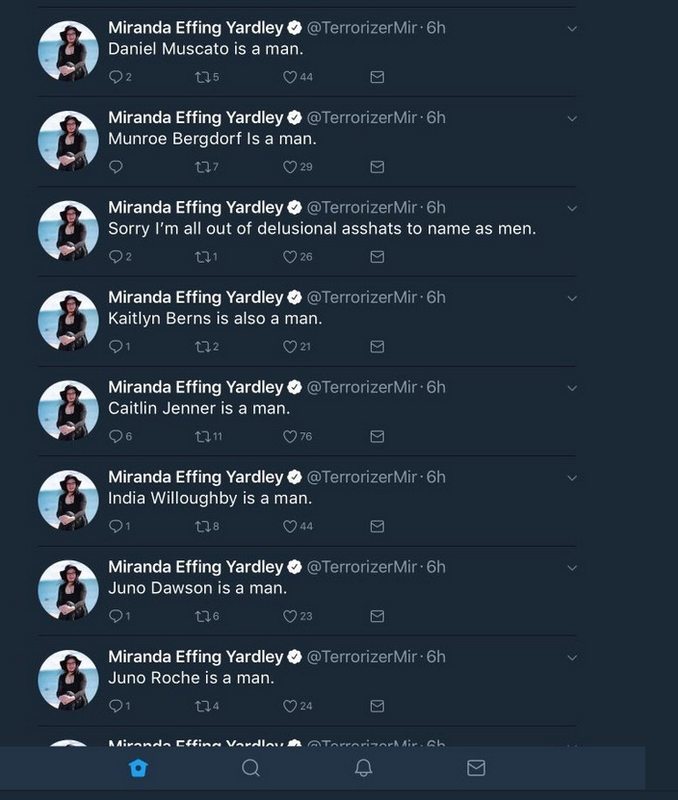 Note: I’ve used she/her pronouns for Miranda throughout despite other media sources referring to her as he/him, as well as many of her supporters. 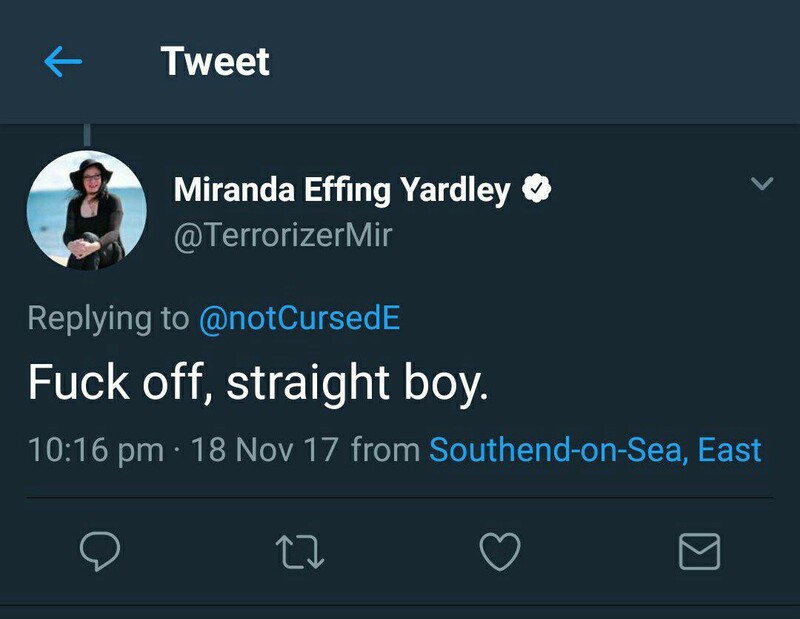 I’ve never seen Miranda say which pronouns she prefers, and I find it distasteful to misgender trans women, even if they’re abusive like Miranda. Though of course, if she would prefer I use he or they I will glady change the article to suit that. The United Kingdom recently had our first transgender hate crime case, with allegations made by a mother of a trans child against Miranda Yardley. A transphobic harasser of trans people online, who just so happens to be trans herself. The case, preceeded over by Judge John Woollard, was ‘thrown out’ due to lack of evidence. With the defense, and subsequently their friends and fans online, claiming its ridiculous that a trans woman could be put on trial for transphobia, at the behest of a cis parent to a trans child. I don’t want to talk too much about the case. I mean, yeah I’m disappointed in the outcome. 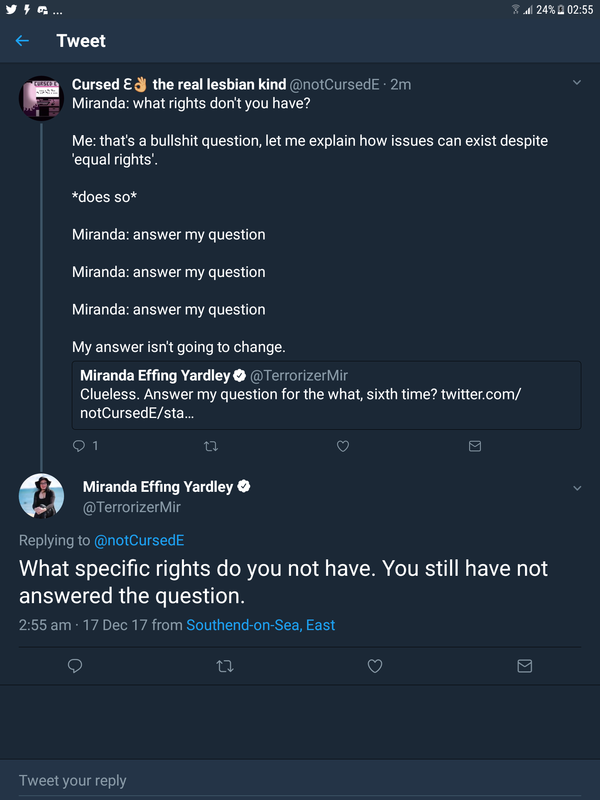 I think it was a huge misstep which has emboldened transphobes online, and also Miranda herself. Who has been lapping up the recent attention boost ever since she almost became entirely irrelevant after her Twitter ban. I really do believe the crown prosecution service, who decided to push the case through, let trans people down by not making sure they had everything they needed to ensure a guilty verdict. 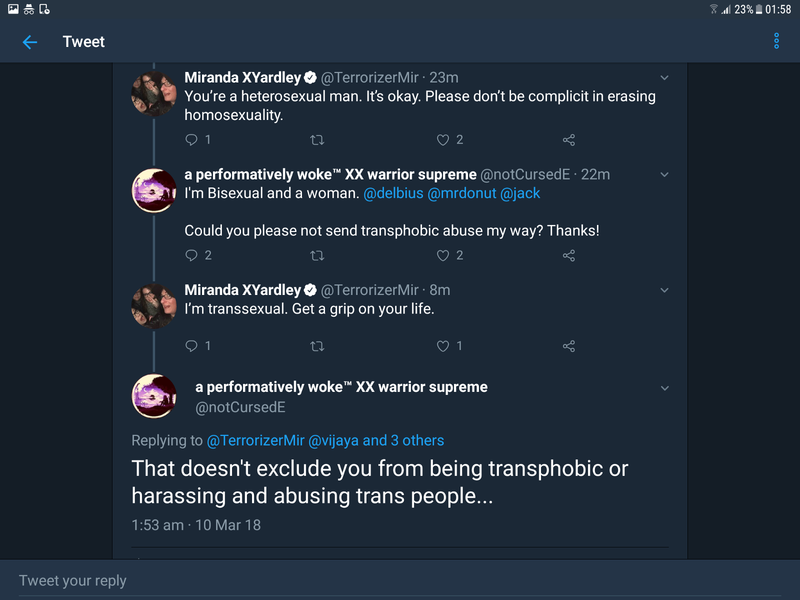 And it’s not like there’s not plenty of it out there — Miranda engaged in quite the crusade of anti trans harassment and bullying online. You really don’t have to look far or ask many people for examples of that. 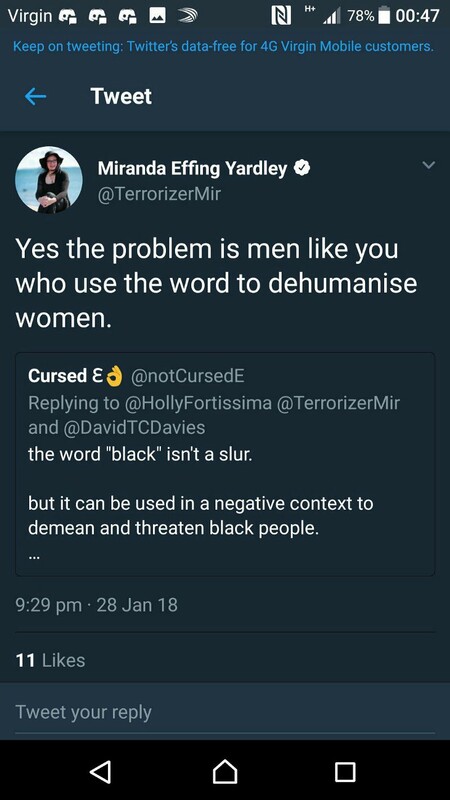 What I do want to do instead, at the risk of giving her the attention she so desperately craves, is show the extent of her transphobic harassment. 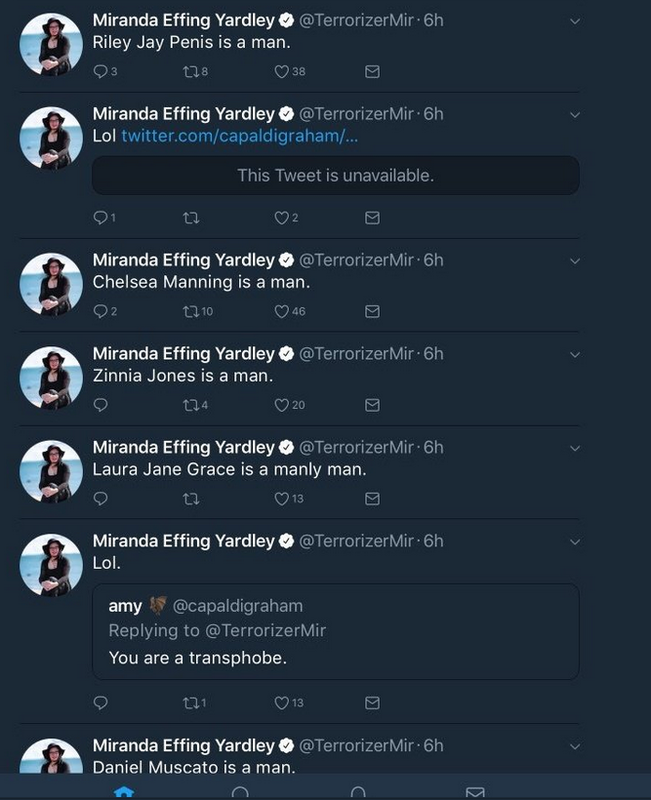 So that even if this case was thrown out, people can search “Miranda Yardley” “transphobe” or whatever and find this article. Filled to the brim with examples of her harassment of me personally. Here’s the autogynephilia chorus — on numerous occasions Miranda accused me of being an autogynephile. For the uninitiated, in the most neutral terms possible, that means a man who has a sexual paraphilia for imagining themselves as a woman. This is age old prejudice against trans people, and heck, even gay people. The idea that who they are is some kind of sexual perversion and is why they shouldn’t be supported or accepted. It has no grounding in reality and is heavily rejected by the trans community and doctors who support us. 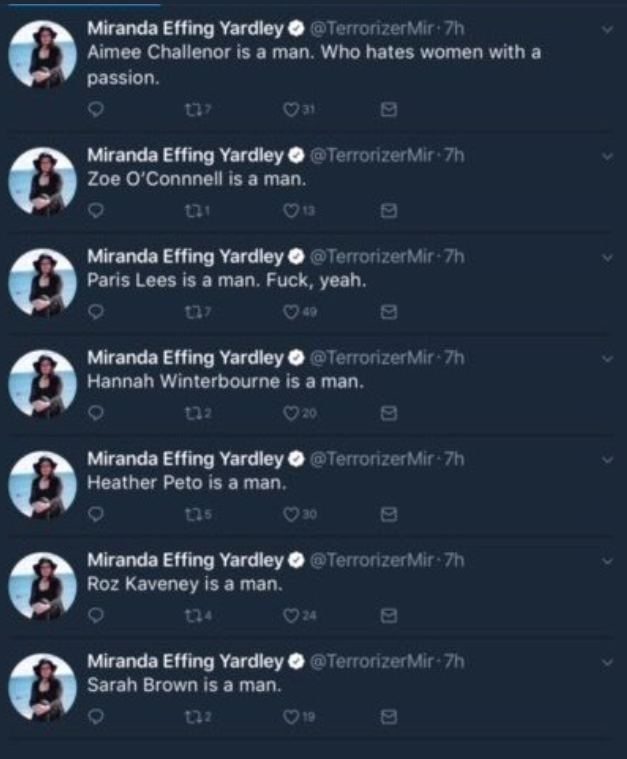 On other occasions, we have just plain old misgendering from Miranda. She’s aware I’m a woman, she just doesn’t agree, and so calls me a man instead. And even went as far as denying my sexuality, which I describe as bisexual — by calling me straight. I assume because I’m openly in a lesbian relationship and she doesn’t like that and obviously my relationship is entirely her business, for you know… reasons. 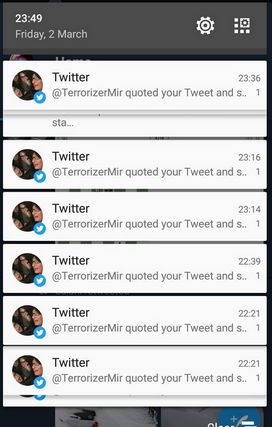 Another form her harassment of me personally took, was repreated quote tweets. Some framed as discussion, others just you know… generally being mean. 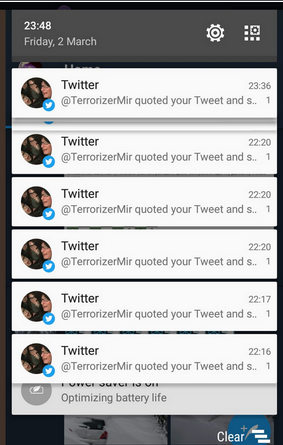 Most of the above tweets you’ll notice are also quote tweets. I would get upwards of 10 within the space of an hour or two. Here’s an example of one of those chains, where I answered the question in the first response, but was still subsequently sent the same question upwards of 6 times, by her own admission. The whole “six foot two, eyes of blue” thing is supposed to be a riff on the creepy lil kid singing “freddy’s coming after you”. A thinly veiled attempt to compare me to a monster or something? To which, when I told her I didn’t want to be referred to like that she told me it was a slogan and to get a sense of humour. There was also the numerous time she’s sent me this phrase. As already mentioned, this is, biphobic, homophobic and transphobic harassment. I repeatedly told her I’m a bisexual woman and in a lesbian relationship, and repreatedly she would tweet abuse at me about this knowing full well I wanted her to stop. And there’s probably so many more examples I could dig up, including the fact that two of Miranda’s real life friends have attempted to intimidate me by searching out my dox information and sharing it around. Neither have succeeded, thankfully, and I only mention it as doxxing is part of why Miranda was bought before a Judge recently. I haven’t even scratched the surface of the receipts I kept. These are just the most prominent and clear examples of transphobic abuse I could find within an hour or two of looking through my PC. 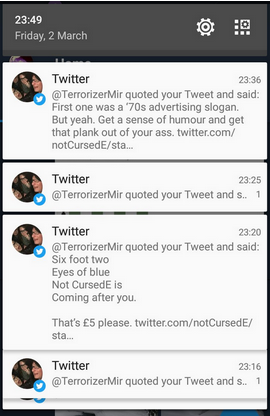 And this is just the harasssment and abuse directed towards me personally. 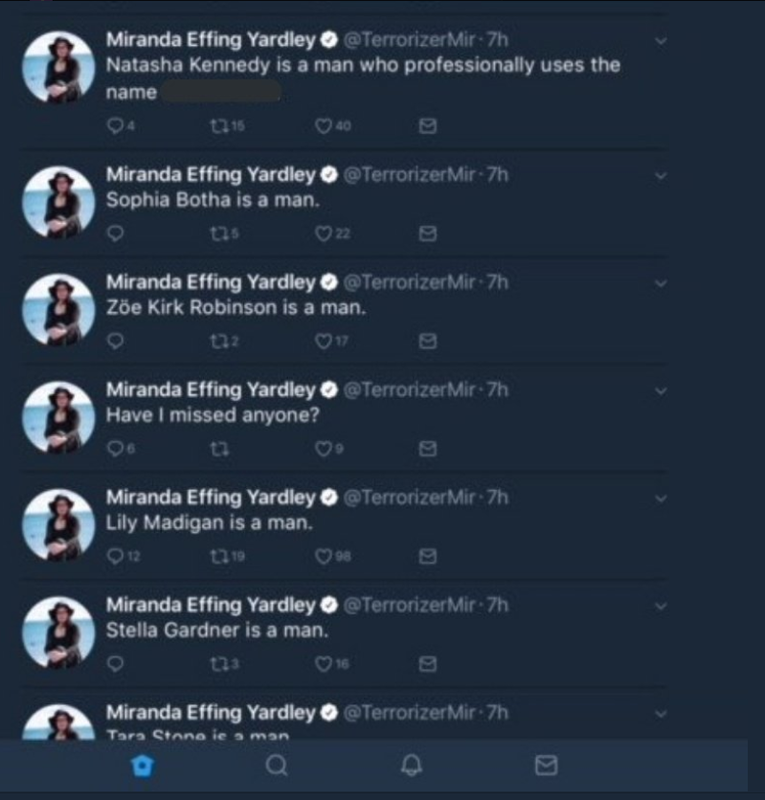 Miranda, seemingly, spent all of her time online doing this to others too. Including the tweets which got her banned, which was basically just “<trans woman> is a man” for every prominent trans person online. So yeah, whether or not the CPS were competent enough to have made a case against her. Whether or not the Judge ruled in her favour or not. 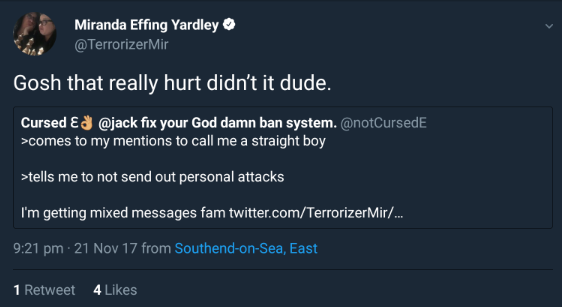 Miranda Yardley is transphobic, homophobic, a harasser and an abuser of people online. There is no disputing the facts — and I urge everyone who has more evidence of her to come forwards and post it below too. Lets make it so nobody can ever deny exactly what she is. enlightened alt centrist woman™ / shitpostin' feather rufflin' and talkin' bout things and stuff.